GAWA is a derivation of gawarn. The echidna may have heard you coming and used its long digging claws to quickly bury itself, escaping you as a perceived threat. Echidna was prized by the Wurundjeri for its fatty delicious meat, which was roasted and eaten only by clan Elders. This lore ensured the slow-moving and easily-captured echidna remained a sustainable resource. Echidna spines were not wasted. 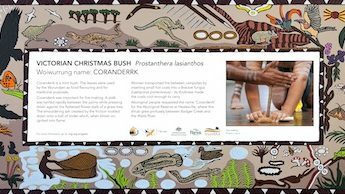 They were kept for Wurundjeri women to thread onto fine bush twine or kangaroo sinew to make intricate, decorative necklaces. DESCRIPTION: The echidna is not easily seen in the wild because of its quiet reclusive nature. The evidence that an echidna has been in the area can been identified by its droppings which are 7cm long cylindrical shapes with unbroken ends. Other foraging activities may be evident from half-ravaged termite mounds which the echidna breaks up with its sharp claws and snout. Echidnas are easily recognized by their coverage of spines. Hair is also present between the spines of the short-beaked echidna, although it is difficult to see. The hair is thicker in the colder, southern regions of Australia. Echidnas range in colour from light brown in the northern, hotter parts of Australia to black in Tasmania. The snout is 7– 8 cm long and is rigid in order to enable the animal to break up logs and termite mounds when searching for food. An echidna’s mouth is on the underside of the front of the snout. This allows the animal to feed easily especially when the baby echidna is suckling on the mother’s teat. The short, stout limbs of echidnas are well suited for scratching and digging the soil. The front feet have five flattened claws which are used to dig forest litter, burrow, and tear open logs and termite mounds. The back feet point backwards and help to push the soil away when the animal is burrowing. Two of the claws on each back foot are used for grooming. An echidna’s tail is short, stubby and hairless underneath. DISTRIBUTION: The short-beaked echidna although widely distributed throughout Australia and in abundant numbers, it is nevertheless a protected species in NSW. In temperate climates, echidnas are most often seen during early morning and in the late afternoon, as they tend to avoid temperature extremes. Similarly in arid regions echidnas may forage during the night and in the hotter part of the day shelter in rock crevices or caves. The distribution of the echidna ranges from undisturbed to disturbed habitats, and includes forests, woodlands, scrublands and grasslands, rocky outcrops and agricultural lands. Although a solitary animal its territory is large and often overlaps with that of other echidnas. Echidnas are usually found among rocks, in hollow logs, under vegetation or piles of debris, under tree roots or sometimes in wombat or rabbit burrows. During rainy or windy weather they often burrow into the soil or shelter under tussocks of grass or under bushes. LIFE CYCLE OF THE ECHIDNA: Like the Platypus, the Short-beaked Echidna is an egg-laying mammal or monotreme and lays one egg at a time. The eggs hatch after about 10 days and the young, emerge blind and hairless. Clinging to hairs inside the mother’s pouch, the young echidna suckles for two or three months. Once it develops spines and becomes too prickly, the mother removes it from her pouch. DULAIWURRUNG PLATYPUS flourished in the Yarra Catchment which includes the Watsons Creek. The Wurundjeri hunted platypus for food with long spears but the meat was not highly prized. The pelts were used for small items of covering. Being such a curious little animal, there were stories about how the water rat and duck had got together producing platypus babies d builds a burrow for it. It continues to suckle for the next six months. USES: Echidnas are ground dwelling and move slowly and have no protection against a spear-wielding hunter. Echidna meat was much prized by the Wurundjeri people. However under Wurundjeri lore only the Elders were allowed to eat the meat. 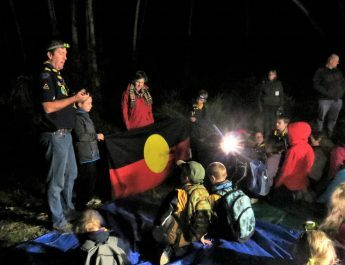 In this way the Wurundjeri practised sustainable hunting and ensured that the population of echidnas was maintained. 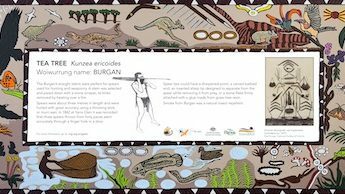 Echidna spines were also valued by Wurundjeri women because they made attractive necklaces: the spines were threaded on fine twine or kangaroo sinew.